This unit was the first Sheriff's Office traffic unit in the state of North Carolina . 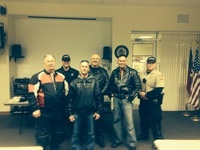 The unit was first formed in the early 80's through grants from the Governor's Highway Safety program. Ours has been a model for other traffic units throughout the state. Professionalism is the unwritten creed of this unit. We work closely with area agencies including the North Carolina State Highway Patrol to conduct various checkpoints throughout the course of the year. Our first and foremost concern is the protection of the citizens of New Hanover County including the children through the preventative patrolling of school zone during school hours. The unit has the most modern equipment available to include stop strips which are used to de-escalate potentially dangerous vehicular pursuits before entering populated areas. The unit also has at it's disposal six Harley-Davidson motorcycles, also equipped with RADAR, which are used for special escorts as well as additional speed enforcement tools.